‘Like a Chamomile bed, the more it is trodden, the more it will spread’, says Shakespeare. With its power to enhance the life force in the body, German Chamomile also known as Blue Chamomile alleviates all kinds of physical and emotional blues. Botanically known as Matricaria Chamomilla, the gentle and grassy aroma of this oil implants calmness in the mind and grants solace to the heart. Held high across the world for its strongest anti-inflammatory compounds instilling a gentle effect on pain and inflammation, German Chamomile is remembered as one among the best and safest essential oil for people of all ages including children. Called as Karpurapuspa in Sanskrit and Baboona or Babuna in Hindi, German Chamomile and its essential oil have been used in Ayurveda, the oldest healing methodology of the world as a remedy for itchy skin, dermatitis, menopausal problems, tension, eczema, migraine pain, burns, skin irritation, dysmennorhea, liver congestion, arthritis, PMS, skin inflammation, amenorrhea, anemia, toothache, colic, inflammatory bowel disorders and formation of leukocytes. Chamomile is regarded as one of the oldest herbs used in the history for medicinal purposes. The German variety is indigenous to Nepal and is found all over the world including the temperate zones of Australia, Asia, Europe (Hungary and France) and North America. This herb is a member of the sunflower or daisy family Asteraceae and is called by other names such as Hungary Chamomile, Blue Chamomile, Matricaria, Scented Mayweed or Wild Chamomile. The name ‘Matricaria’ has its origin from the Latin name ‘Mater’ meaning ‘Mother’ and is extremely helpful in treating numerous womanly problems. It is regarded as one of the most distinguished herbal teas of the world and nearly one million cups of Chamomile tea are consumed every day. The most interesting historical reference of this herb dates back to 78 A.D when Europe’s first medical reference book De Materia Medica was written by Dioscorides. German Chamomile has its name listed in the potent herbs for treating many health conditions and is also listed as one of the most sacred herbs in Lacnunga, the antique manuscript. It is used in herbal medicine as a serene sleep aid, for treating sore stomach, bacterial infections, inflammation, irritable bowel syndrome and as a mild laxative. German Chamomile has been used as a natural aid for assisting problems related to women especially with its emmenagogue properties that help in relieving from painful menses, delayed menstruation, menopausal problems and as a uterine tonic. The herbal infusion, decoction or tea prepared from the flowers of German Chamomile was taken in folklore medicine for assisting in cases of motion sickness, vomiting, indigestion, flatulence and ulcerative colitis. It has been used for numerous centuries in the traditional medicine for treating dermatitis, skin inflammation and gastrointestinal tract symptoms. Dried German Chamomile flowers were used in compress or infusion for alleviating pain and inflammation associated with rheumatism, arthritis and other inflamed conditions. German Chamomile was prescribed by the Greek physicians for treating female disorders, fever, restlessness, neuralgia, stress and insomnia. It was used as a tenderizing agent for preserving meat in the ancient period. The major chemical components of German Chamomile oil are ‘terpenoids α-bisabolol and its oxide azulenes including chamazulene and acetylene derivatives’ (bisabolol oxide A, bisabolene oxide A, a-bisabolol and bisabolol oxide B) along with farnesol, thujanol, bisabolol, coumarin and farnasene. The remedial properties of this oil are anti-inflammatory, emmenagogue, immuno-stimulant, anti-anemic, stomachic, anti-allergenic, antiphlogistic, analgesic, bactericidal, anti-spasmodic, vasoconstrictor, antibiotic, carminative, digestive, cicatrisant, vulnerary, cholagogue, hepatic, vermifuge, and sedative. Ayurveda is the ancient wisdom of healing and it fervently imparts that every human being should follow a disciplined life and must have ample knowledge about his/her health. It is a Vedic science rewarded by the Saints, Sages and Ancient Gods of Hinduism to humanity. Ayurveda simply means knowledge of life (Ayur – Life and Veda – knowledge). The most predominant factor behind Ayurveda’s existence as a mother of all healing sciences including the Traditional Chinese Medicine, Siddha, Unani, Homeopathy, Acupressure, Naturopathy, Aromatherapy and Chiropractic. The distinctiveness of Ayurveda is its adherence to Mother Nature, which insists to maintain balance with nature for a healthy and harmonious life. Ayurvedic principles state that living in harmony with nature is the absolute way to heartiness, prevention of illnesses, healthy aging and longevity. As per the Ayurvedic philosophy, the whole thing on earth is a grouping of the five vital elements of nature namely water, fire, earth, space and air, where water stands for the blood in the body, fire represents the body temperature and metabolic functions, air assists in breathing, earth symbolizes muscles and bones, space or ether signifies the soul. Every individual is considered as a unique part of nature with a unique individual constitution (the physical, psychological and spiritual make up of a person) just like our fingerprints. This constitution is an arrangement of three biological energies known as doshas. They are vata, pitta and kapha dosha. Vata is a combination of air and space and is responsible for nervous functions and governs the working of the autonomous and central nervous system. Kapha is a grouping of water and earth and is in charge for virility, stability, binding power and vigor of the body. Pitta dosha is a blend of fire and water and is accountable for metabolic functions, tissue building, endocrine functions and body temperature. Every one of us has a predominance of any one of these doshas and this predominant dosha decides our unique persona, temperament and behavioral patterns. Absolute balance between these doshas is a sign of good health and imbalances of these dynamic energies due to food, weather conditions and other lifestyle changes cause illnesses. Ayurvedic treatments vary from individual to individual even if it is for the same illness because this traditional system observes the individual constitution, medical history of the patient and the root cause of an illness before prescribing the appropriate medicines. The most established Ayurvedic medications are plant essential oils, herbs, yoga, Abhyanga or Ayurvedic massaging, Ayurvedic routine, simple physical exercises, prayer and meditation based on upon the distinctive individual constitution for correcting the imbalance of doshas. German Chamomile oil has the potent to pacify aggravated pitta and kapha doshas and balance vata dosha. 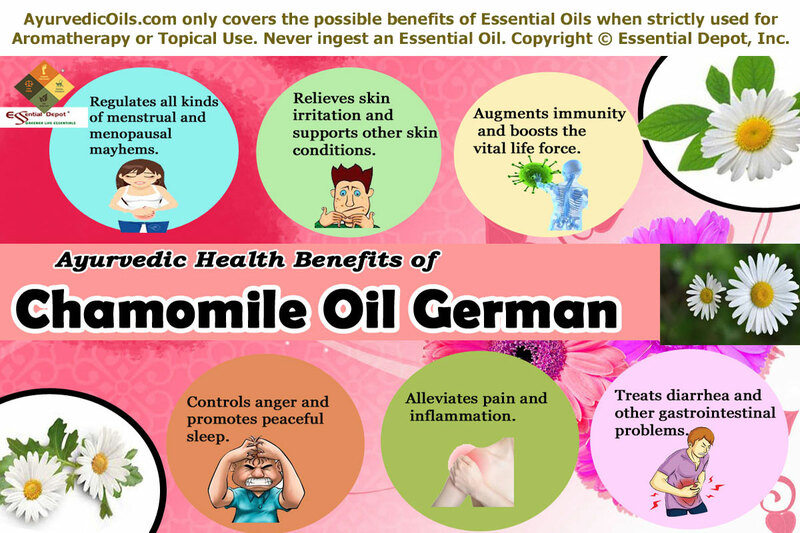 These amazing healing attributes make German Chamomile oil as an excellent Ayurvedic remedy for treating inflammation, skin irritation, lack of immune power, anemia, amenorrhea, menopause, anger, headache and other female reproductive problems. German Chamomile essential oil has numerous beneficial effects on the reproductive tissue known as shukra dhatu in Ayurveda. Ancient Ayurvedic texts also say that this herb has therapeutic properties for regulating menstrual activities and is called as artavashamana. Massaging your lower abdomen and thighs with 2 drops of German Chamomile oil and 2 drops of Lavender oil along with 2 ml of sesame oil can be of great help in relieving menstrual pain or dysmennorhea, premenstrual fatigue and headache, promote menstruation in case of blocked or delayed menses and alleviate all kinds of menstrual discomforts. This massage also serves as a cooling natural remedy to treat the hot flashes, excessive discharge and mood fluctuations during menopause. German Chamomile tea was prescribed in Ayurveda to lessen pain during childbirth and for easing nausea during pregnancy. Certain studies have proven that Chamomile douche may possibly get better the symptoms of vaginitis or vaginal inflammation in women. Mostly women of all ages are affected by vaginal inflammation and vaginitis is coupled with pain during urination, itching and vaginal discharge. German Chamomile oil is also effective in treating Atrophic vaginitis also, which occurs due to low estrogen levels in postmenopausal and menopausal women. The relaxing, anti-inflammatory, antiseptic and wound healing properties of this oil assists in relieving skin problems rapidly in case of varicose ulcers, wounds, burns, stings, allergies, cystitis, vaginitis, neuralgia and skin ulcers. Adding 2 drops of German Chamomile oil along with 2 drops of Rose Geranium oil to bathing water can be helpful in killing germs, bacteria and fungi responsible for skin infections like athlete’s foot, candida, acne, cystitis, Urticaria and dandruff. This bath also helps in combating the harmful bacteria like Staphylococcus aureus that causes wounds and other skin conditions to turn septic. It also helps in lessening one’s sensitivity to allergens like dust and pollen and aid in treating hay fever, sinusitis, chronic catarrh and eczema. Massaging the affected areas with 3 drops of German Chamomile oil blended with 2 drops of Sandalwood oil and 3 ml of jojoba oil can help in healing wounds, eczema, psoriasis, varicose ulcers and burns. 2 drops of German Chamomile oil added to a cup of warm water can be used as a gargle for treating gingivitis, plaque, sore throat, mouth ulcer and bad breath. German Chamomile oil controls the flow of Life Force, also known as Qi or Chi with its cooling and tranquilizing effect on the system. With its immune enhancing power, this oil assists in preventing infectious diseases by strengthening the disease resistance power of the system. Since the traditional times, this oil acts as a promising natural remedy for treating almost all kinds of diseases. According to Ayurveda, German Chamomile oil has kasasvasahara or therapeutic properties for alleviating respiratory problems like cough, cold, breathing difficulties, tonsillitis, flu, broncho-constriction in asthma and sinusitis. This oil is also said to have fever lessening properties known as jwaraghna with its power to reduce excess of pitta energy responsible for body temperature. German Chamomile oil also has other healing properties helpful in relieving gout, eye inflammation, arthritis, conjunctivitis, rheumatism, carpal tunnel syndrome, blepharitis, meibomian cysts, fibromyalgia, lumbago, hepatitis, gallbladder infections, anemia, teething pain, abscesses, viral colitis, Alzheimer’s disease, diaper rashes, nervous tension and certain other health conditions. The essential oil of German Chamomile helps in calming and relaxing the mind and body with its naturally cooling effects. It regulates anger, rage, irritation and aversion caused due to the excess heat in our mechanism. The cooling properties of German Chamomile oil reduce pitta dosha especially sadhaka pitta (pitta in the mind and heart). Excess of which is responsible for the generation of heat energy in the body. By this way, it pacifies the mind, cools the body and instills gentle and positive feelings from within. Gently massaging your system with 5 drops of German Chamomile oil blended with 5 drops of Lavender oil and 5 drops of Tea tree oil with 10 ml of coconut oil is an excellent way to keep you cool throughout the day. Adding 1 drop of German Chamomile oil in your handkerchief or a tissue paper and carrying it with you all through the day can help in releasing negative emotions soothingly and induce clarity, improve self-esteem and self-realization. Adding 2 drops of German Chamomile oil and 2 drops of Rose oil in warm bathing water before going to bed can be of great help in relaxing the tensed nerves, aching muscles and in promoting peaceful sleep. You can also add 2 drops of German Chamomile oil in your diffuser or vaporizer in the bedroom for relieving anxiety and mental agonies. German Chamomile oil has also been proven in several studies as an efficacious natural remedy for treating GAD or generalized anxiety disorder. Chamomile is widely accepted as gentle tranquilizer and sleep-inducer. A 2010 study published in PubMed quotes “inhalation of the vapor of chamomile oil reduced a stress-induced increase in plasma adrenocorticotropic hormone (ACTH) levels.” Inhaling the aroma of this oil influences sedative effect in the body by binding the GABA and BDZ receptors in the brain. Inhaling the herbaceous, intensely sweet and fruity aroma of German Chamomile oil especially during Pranayama (balanced breathing exercise), meditation and prayer enhances our spiritual energy to the next level and augments our soul’s connectedness with the Divine Power. German Chamomile essential oil is often trusted to lessen pain, reduce muscular spasms and alleviate gastrointestinal inflammatory problems and other inflammatory disorders. Certain studies reveal that Chamomile restrains Helicobacter pylori, which causes to stomach ulcers. The anti-inflammatory and antiphlogistic activities of German Chamomile are attributed to its chemical components like matricin, alpha-bisabolol oxides A and B, and alpha-bisabolol. This oil has excellent diuretic properties, known as mutrala in Ayurveda and helps in relieving urinary infections, inflammation in the bladder and other kidney infections along with eliminating the toxic deposits in the system. Massage the painful or inflamed parts with 3 drops of German Chamomile oil blended with 3 drops of Yarrow oil also known as Yara Yara oil with 5 ml of coconut oil to alleviate pain, mitigate spasms, reduce inflammation, promote blood circulation and eliminate toxic substances in the system and lessen water retention, leading to obesity, rheumatism, arthritis etc. Both German Chamomile and Roman Chamomile have been used as a traditional remedy for treating colic, especially in children, diarrhea, stomach cramps, gas, intestinal spasms, irritable bowel syndrome, indigestion, stomach ulcers and gastrointestinal disorders. German Chamomile oil is known as a digestive relaxant that helps in soothing the muscles, relaxing the stomach and leaves a gentle effect on the intestines, to help in pacifying stomach ulcers, flatulence, anorexia, diarrhea, bloating, intestinal gas and morning sickness. Massaging your abdomen gently with 2 drops of German Chamomile oil and 2 drops of Peppermint oil along with 2 ml of almond oil can help in relaxing muscular contractions in the stomach and intestines along with reducing excess of digestive fire or pitta energy causing diarrhea and painful ulcers. The gentle and cooling effect of German Chamomile oil along with the cool minty effect of Peppermint oil gradually reduces pain in the stomach and intestines and grants peaceful sleep especially in children who suffer from colic. This information is only for educational purposes and is expressed wholly in the concern of spreading the cultural wisdom of Ayurveda, the mother of all healing sciences. The remedies listed in this article are not intended to prevent, cure or diagnose any medical condition or as an alternate for any kind of prescription remedies or any medical advice of a healthcare professional. Internal use of essential oils is strictly not recommended. Ensure that you dilute essential oils in suitable carrier oils before you use it on the skin topically, as high quality, unadulterated and organic essential oils are extremely concentrated substances and may cause allergic reactions if used on the skin directly. Speak with your Ayurvedic professional/healthcare expert before choosing the appropriate essential oils for your unique individual constitution and state of health. Avoid using German Chamomile oil if you are pregnant or nursing your baby, because this oil has high emmenagogue properties that may induce menstruation. 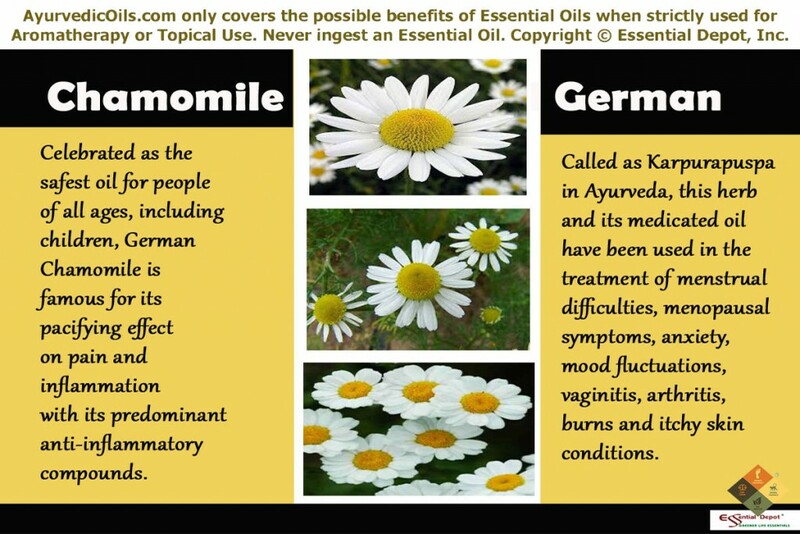 This entry was posted in Essential Oils - Learn About and Purchase and tagged Ayurvedic health benefits of German Chamomile oil, Ayurvedic oils for acne, Ayurvedic oils for anemia, Ayurvedic oils for anxiety, Ayurvedic oils for arthritis, Ayurvedic oils for colic in children, Ayurvedic oils for diarrhea, Ayurvedic oils for eczema, Ayurvedic oils for gastrointesinal problems, Ayurvedic oils for immunity, Ayurvedic oils for inner peace, Ayurvedic oils for insomnia, Ayurvedic oils for irregular periods, Ayurvedic oils for menopausal problems, Ayurvedic oils for menstrual pain, Ayurvedic oils for mental clarity, Ayurvedic oils for migraine pain, Ayurvedic oils for rheumatism, Ayurvedic oils for skin problems, Ayurvedic oils for ulcers, Ayurvedic oils for vaginitis, Ayurvedic remedies for insomnia, Chemical constituents of German Chamomile oil, Generalized Anxiety Disorder, German Chamomile essential oil, German Chamomile oil in Ayurveda, Health benefits of German chamomile oil, Matricaria Chamomilla, Natural remedies for GAD, Therapeutic properties of German Chamomile oil by AyurvedicOils. Bookmark the permalink.